Mantras are Sanskrit words and phrases that are said to have power. They are an effective tool for meditation and are easy to use. The following is just a brief introduction to some mantras. 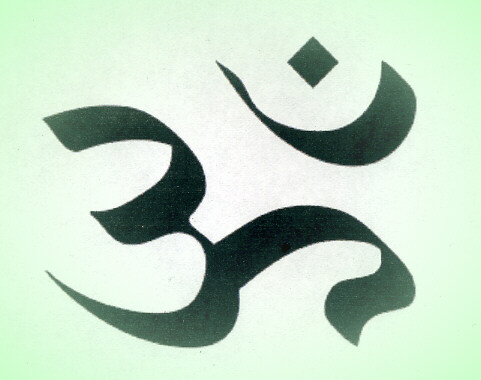 The Sanskrit character for OM. The following mantras are not part of Siddha Yoga. They are taken from the book "Shakti Mantras", by Thomas Ashley-Farrand, unless otherwise stated. They are centred on the powers of Indian goddesses who are considered to represent various aspects of the Great Feminine principal, otherwise known as Shakti. The mantras treated here are as simple to use as they are effective. It is said that these mantras, to be effective, should be repeated for approximately twenty minutes, twice daily, for forty days. They can be repeated silently or out aloud; read off the page or repeated from memory. Any of these approaches is said to be effective. The reader may notice that many of the mantras begin with the word OM. this is said to be the primordial sound that was present at the creation of the universe. It is used in many mantras and is considered to strengthen them. It is pronounced OME, to rhyme with the English word HOME. The reader may also notice that the mantras often include the word NAMAHA. This word means bowing to or making salutations to. It figures prominently because many of the mantras, if not all, are expressions of bowing down to, or making salutations to, the god or goddess from whom one desires help.